As I’m writing this, I’m grazing on some local organic Washington berries that were hand picked just a few miles away. We’ve made the Pacific Northwest our new home (North Washington to be exact) for the last 5 weeks, and l have to say we’ve been tacking this culture change pretty well. It’s amazing how one can adapt to new surroundings. I’ve always found myself easy to blend in, talking to the locals, learning the area, but the first thing I always do when moving or even traveling to a new area is learn what the locals eat! Salmon is insanely huge here. And whatever you do, don’t even think about dolloping tartar sauce on it. 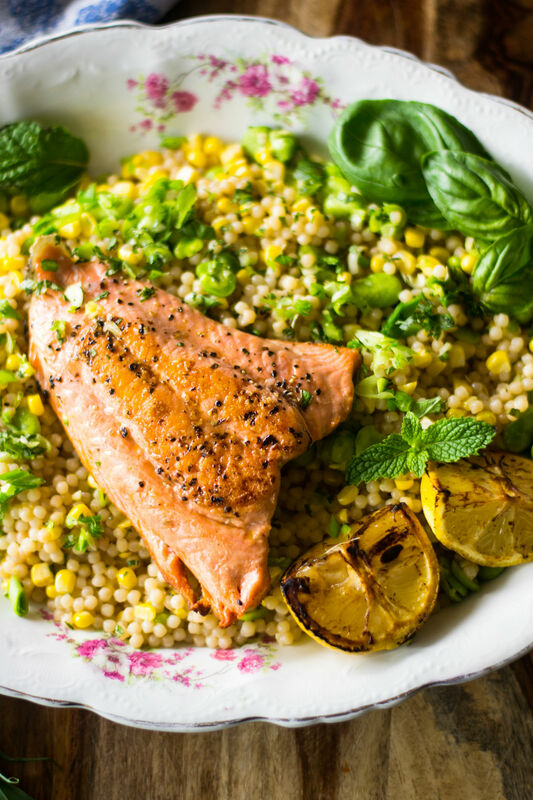 Washingtonians live off of seasonal wild salmon and they say the salmon should be so fresh and delicious, that all you’ll need is a squeeze of lemon and nothing else. Well I listened, mostly, doing as little as possible the seasonal wild salmon. A simple sprinkle of salt and pepper is all I did, but coated the Israeli couscous salad with a bright, lemony herb dressing. The combination of the crisp lemon vinaigrette, seasonal produce (I added corn and fava beans) and fatty charred salmon was a fabulous win for one of our first summer nights in our new home. First make the lemon vinaigrette. In a small bowl, whisk all ingredients together and set aside. Taste for seasoning. If you haven’t shelled fava beans before, it takes a bit of prepping. Remove beans from the pod and soak in very hot water for 30 seconds. Then drain in a colander, running cool water over them to stop the cooking. Then carefully remove the outer “shell” from each bean, using the tender and bright green bean. In a medium sized pot, add the Israeli couscous and the vegetable stock and bring to a boil, then lowering to a simmer and continuing to cool for about 10 minutes or until the couscous is al-dente. Once done, drain couscous and add back to the pot, heat off. Add the corn kernels to the couscous (yes, the corn is uncooked because it was so delicious, but you can cook if you prefer), fava beans and lemon dressing. Season with salt and pepper and toss everything together. Set aside. Next, drizzle olive oil into a cast iron skillet and place on high heat (or you can cook on the grill or grill pan), season salmon with salt and pepper and place in the pan, skin side down, cooking for about 2-3 minutes until skin is charred, then carefully flip over, cooking the other side for another 2 minutes. Remove salmon. In the same hot pan, add the lemon quarters, charring for about 1 minute. 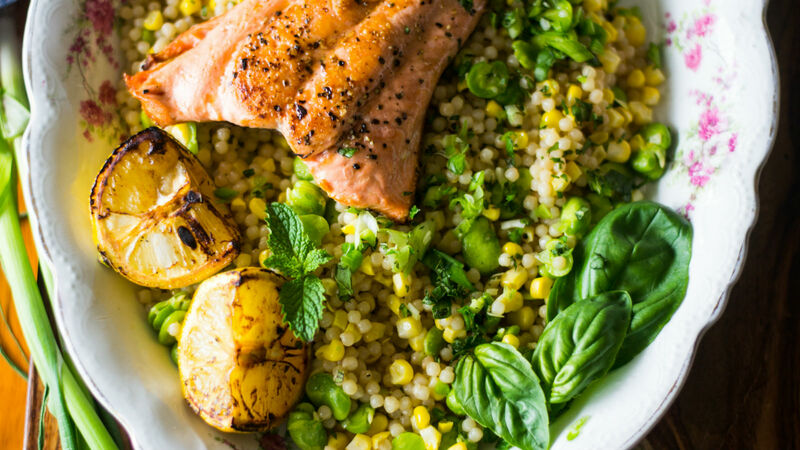 Once done, add Israeli couscous salad to a platter, topping with salmon filet and garnishing with charred lemon wedges and more fresh mint and basil.